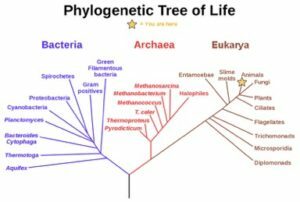 The evolutionary relationships of various life forms on Earth can be summarized in a phylogenetic tree. A phylogenetic tree is a diagram showing the evolutionary relationships among biological species based on similarities and differences in genetic or physical traits or both. A phylogenetic tree is composed of branch points, or nodes, and branches. The internal nodes represent ancestors and are points in evolution when, based on scientific evidence, an ancestor is thought to have diverged to form two new species. The length of each branch can be considered as estimates of relative time. In the past, biologists grouped living organisms into five kingdoms: animals, plants, fungi, protists, and bacteria. The pioneering work of American microbiologist Carl Woese in the early 1970s has shown, however, that life on Earth has evolved along three lineages, now called domains—Bacteria, Archaea, and Eukarya. Woese proposed the domain as a new taxonomic level and Archaea as a new domain, to reflect the new phylogenetic tree (Figure 11). Many organisms belonging to the Archaea domain live under extreme conditions and are called extremophiles. To construct his tree, Woese used genetic relationships rather than similarities based on morphology (shape). Various genes were used in phylogenetic studies. Woese’s tree was constructed from comparative sequencing of the genes that are universally distributed, found in some slightly altered form in every organism, conserved (meaning that these genes have remained only slightly changed throughout evolution), and of an appropriate length.